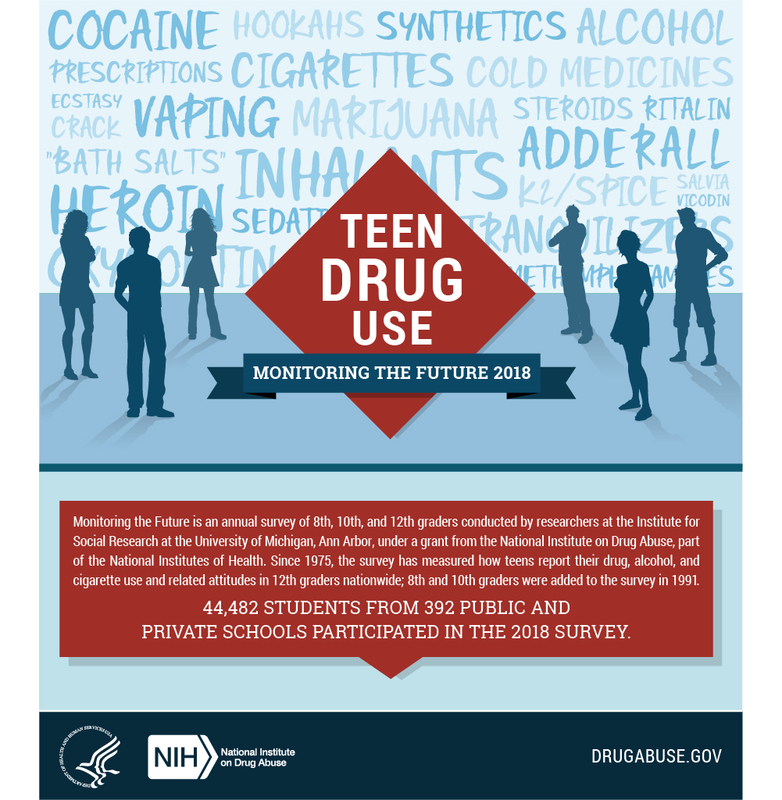 Monitoring the Future is an annual survey of 8th, 10th, and 12th graders conducted by researchers at the Institute for Social Research at the University of Michigan, Ann Arbor, under a grant from the National Institute on Drug Abuse, part of the National Institutes of Health. Since 1975, the survey has measured how teens report their drug and alcohol use and related attitudes in 12th graders nationwide; 8th and 10th graders were added to the survey in 1991. 44,482 students from 392 public and private schools participated in the 2018 survey. 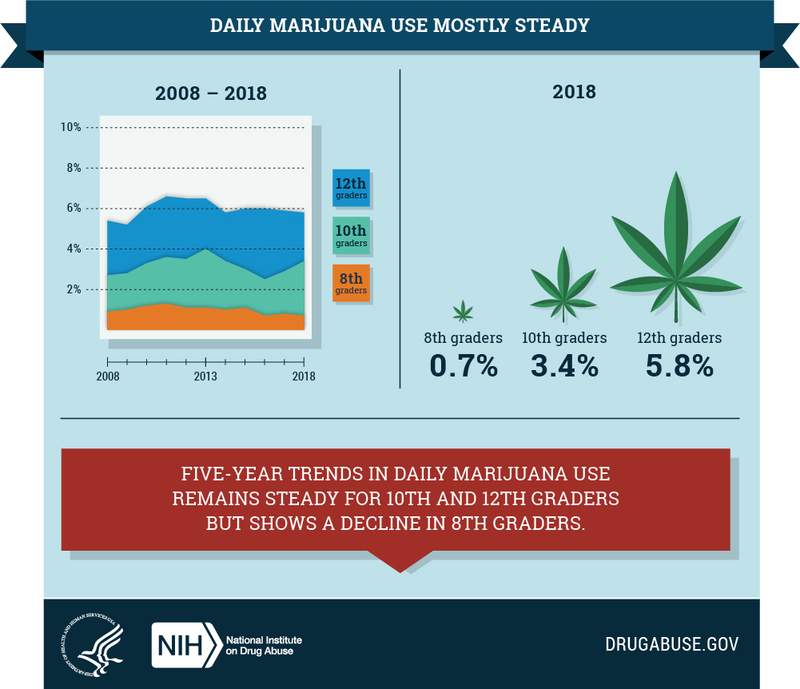 From 2008 to 2018, daily marijuana use was mostly steady among 8th, 10th, and 12th graders. Five-year trends in daily marijuana use remains steady for 10th and 12th graders but shows a decline in 8th graders. 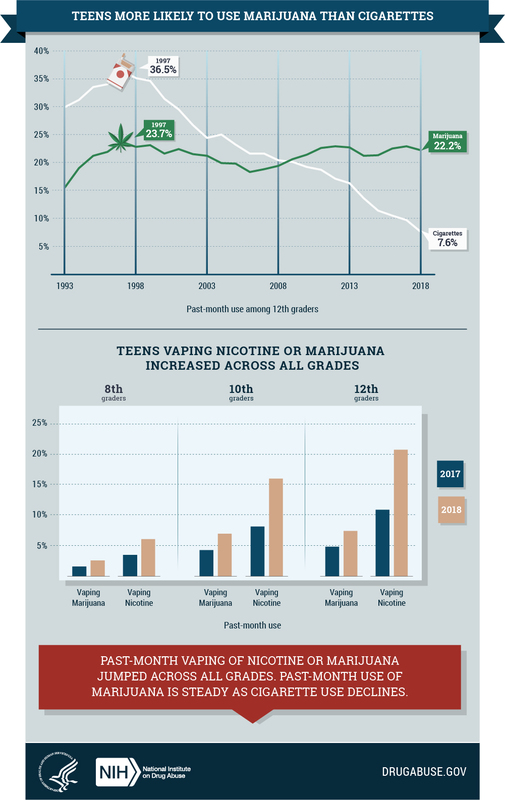 Since 1993, there has been a significant decline in monthly cigarette use among 12th graders, while the rate of monthly marijuana use has increased. In its peak year (1997), monthly cigarette use among 12th graders was 36.5 percent, compared to a rate of 7.6 percent in 2018. In 1993, monthly use of marijuana among 12th graders was 15.5 percent, compared to a rate of 22.2 percent in 2018. 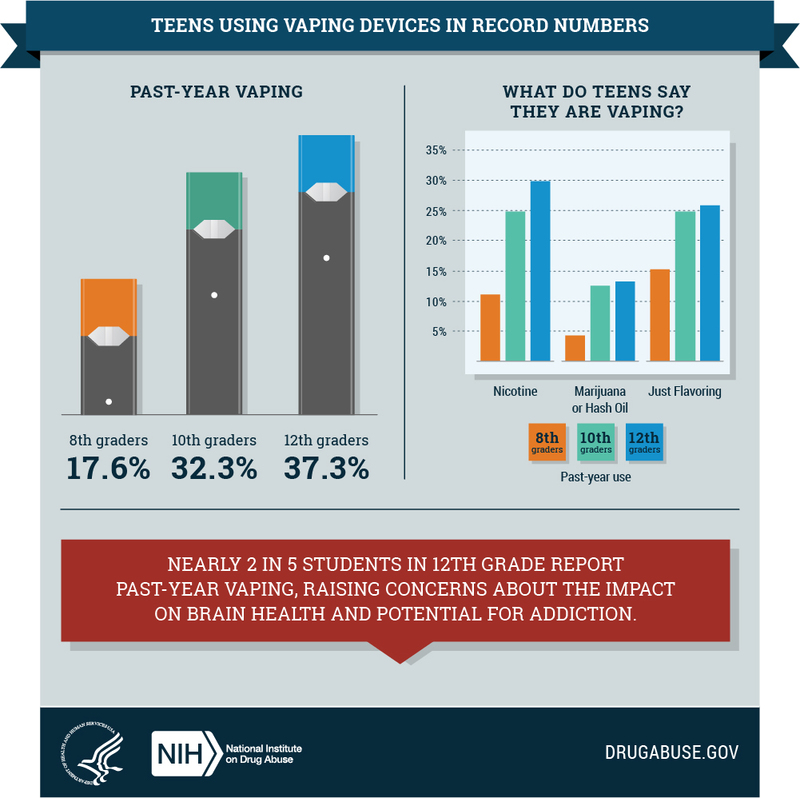 Past-month vaping of nicotine or marijuana jumped across all grades. Past-month use of marijuana is steady as cigarette use declines. 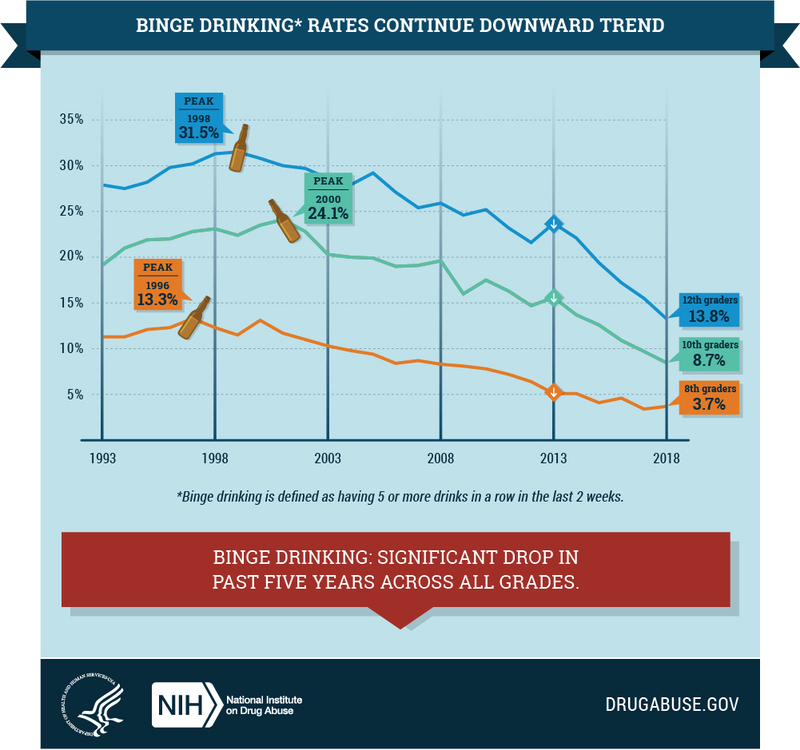 Binge drinking (five or more drinks in a row in the last 2 weeks) dropped significantly in the past five years across all grades. 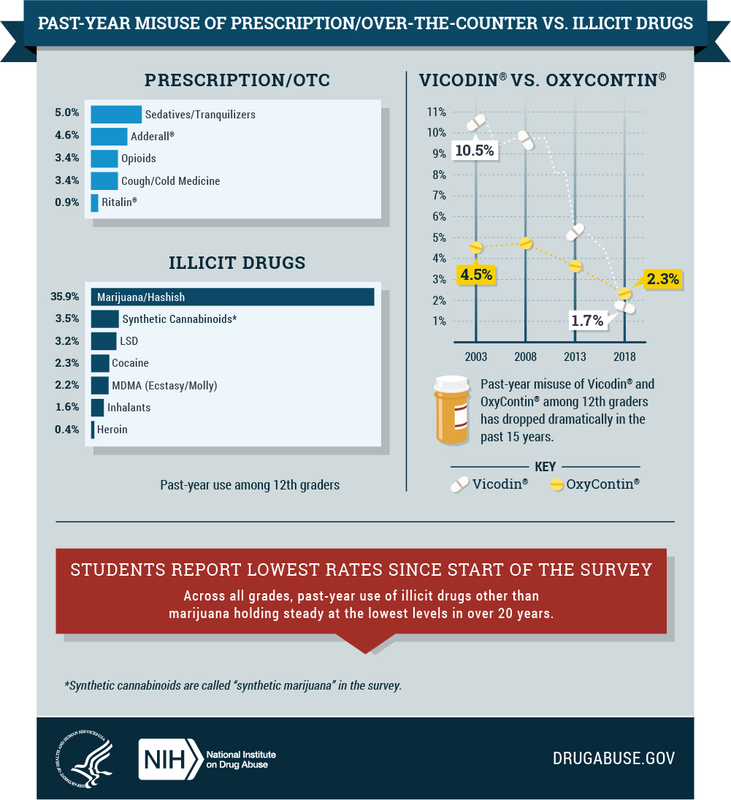 Past-year misuse of Vicodin® and OxyContin® among 12th graders has dropped dramatically in the past 15 years, from 10.5 percent in 2003 to 1.7 percent in 2018 for Vicodin®, and from 4.5 percent in 2003 to 2.3 percent in 2018 for OxyContin®. For more information, visit us at @NIDAnews or drugabuse.gov. The National Institute on Drug Abuse (NIDA) is a component of the National Institutes of Health, U.S. Department of Health and Human Services. The NIDA supports most of the world’s research on the health aspects of drug abuse and addiction. Fact sheets on the health effects of drugs of abuse and information on NIDA research and other activities can be found at drugabuse.gov.